Seneca Valley Virus sounds like the last bug you’d want to catch, but it could be the next breakthrough cancer therapy. Now, scientists at the Okinawa Institute of Science and Technology (OIST) and the University of Otago have described exactly how the virus interacts with tumors -- and why it leaves healthy tissues alone. 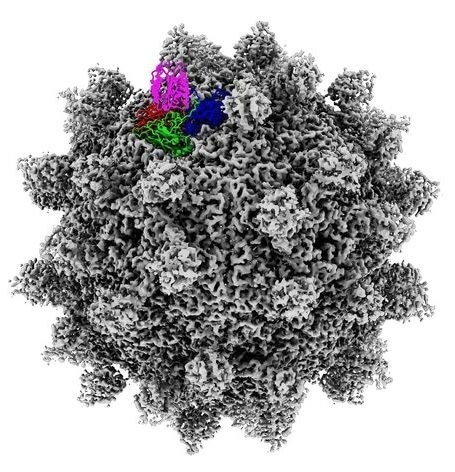 The study, published in the Proceedings of the National Academy of Sciences of the United States of America on October 29, 2018, provides the first detailed images of the complex Seneca Valley Virus forms with its preferred receptor. The researchers used cryo-electron microscopy to capture images of over 7000 particles and render the structure in high-resolution. They predict their results will help scientists develop the virus, and other viral drug candidates, for clinical use. In the past few years, so-called “virotherapy” has grown up as a new branch of cancer immunotherapy. Anticancer viruses tend to target tumors while sparing the healthy cells around them, and many already exist in nature. Scientists hunt down these cancer-killers, study their attack strategies, and optimize their effectiveness through genetic modification. The U.S. Food and Drug Administration has already approved one viral therapy to treat Stage IV melanoma, and other viral drug candidates appear promising in clinical trials. Seneca Valley Virus stands out as a potential virotherapy for one key reason: it selectively targets a receptor found coating tumor cells in over 60 percent of human cancers. The receptor, known as ANTXR1, is only expressed on tumors, but it has a cousin that only appears on healthy tissues, called ANTXR2. Seneca Valley Virus doesn’t bind with the similar receptor on healthy cells -- it only shows strong affinity for ANTXR1. The study’s authors wanted to know why. Seneca Valley Virus has already demonstrated its cancer-fighting abilities in Phase I clinical trials in pediatric solid tumors and Phase II trials in small-cell lung cancers. But there’s one problem: the body builds up immunity to the virus within three weeks and squashes the bug before its work is done. With deeper understanding of how the virus works, scientists may be able to outsmart the body’s immune system and protect their mighty cancer-killer. In principle, Seneca Valley Virus could also be modified to recognize different receptors, Wolf said, rendering it a broadly applicable weapon in the fight against cancer. "I have always been intrigued by ways how we can make use of naturally occurring microorganisms for our benefit,” said Nadishka Jayawardena, a graduate student at the University of Otago and first author of the study. “Being able to work on a virus that can kill cancers is very rewarding, especially knowing that one day our findings could potentially lead to tackling a major global health issue."